While reading about the WWII efforts put out by the city of Rochester I came across something I didn't know about SMCo. Originally they were contracted to make the weaved belts for the belt fed .30 and .50 Cals. It wasn't until finishing this (these) contracts that they then started making Carbine slings. The article I'll link below leads you to believe that with the problems they had with the double weaved belts it wasn't until the summer of 1943 that they started the belts. Then after making 6 million machine gun belts they moved on to make the C tip slings. Since I don't recall seeing a SMCo 43 dated carbine sling........ Do you think they didn't start making then until early 44 ? And if there are 43 dated SMCo slings, they must surely be few.... Maybe even Rare for 1943 ? This link is a good read that includes quite a few of our Carbine makers and suppliers. be completely torn down and redesigned to make machine gun belts. to weave the webbing to the required double thickness. had changed its specifications and now required a new type of belt! The 43 dated smc slings are khaki colored. I may have some then if khaki, but IIRC the ink is smudged so no way to read the date. I recently gathered up and boxed up my slings. Way more slings than I'll ever own carbines for, but can't help buying them when getting a good price. I bulk purchased from a museum in Texas about 6-7 years ago....... should have stopped then, but didn't. I plan to email you per a Stan Pro with some questions, when time allows. 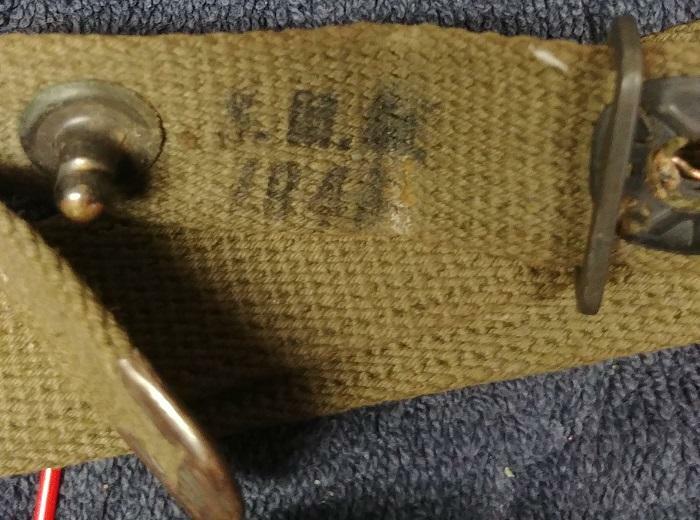 Does this SMCo sling look like it's dated 43? Would you call it Khaki ? Still manufacturing Springfields late in war? Primer manufacturing- Why not ?